Starting with the 2012.10 release series, BeeGFS provides support for metadata and file contents mirroring. Mirroring capabilities are integrated into the normal BeeGFS services, so that no separate services or third-party tools are needed. Both types of mirroring (metadata mirroring and file contents mirroring) can be used independent of each other. Storage and metadata mirroring with high availability is based on so-called buddy groups. In general, a buddy group is a pair of two targets that internally manage data replication between each other. The buddy group approach allows one half of all servers in a system to fail while all data is still accessible. It can also be used to put buddies in different failure domains or different fire domains, e.g. different racks or different server rooms. Note that this is not possible with metadata servers, since there are no metadata targets in BeeGFS. An even number of metadata server is needed so that every metadata server can belong to a buddy group. 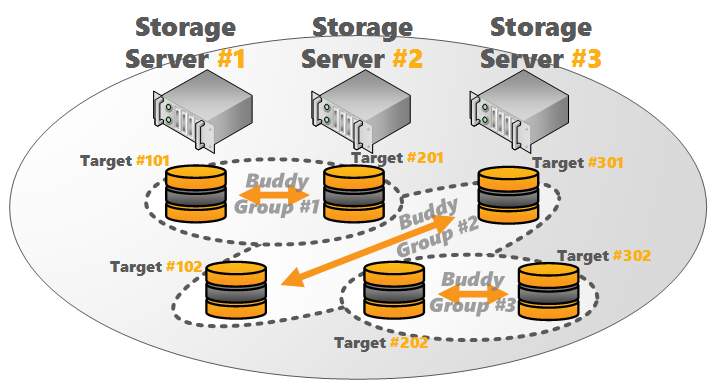 In normal operation, one of the storage targets (or metadata servers) in a buddy group is considered to be the primary, whereas the other is the secondary. Modifying operations will always be sent to the primary first, which takes care of the mirroring process. File contents and metadata are mirrored synchronously, i.e. the client operation completes after both copies of the data were transferred to the servers. Please note that targets and servers that belong to a buddy group are also still available to store unmirrored data, so it is easily possible to have a filesystem which only mirrors a certain subset of the data. A failover of a buddy group can only happen if the BeeGFS Management service is running. That means, that no failover will occur, if the node with the beegfs-mgmtd service crashes. Therefore, it is recommended to have the beegfs-mgmtd service running on a different machine. However, it is not necessary to have a dedicated server for the beegfs-mgmtd service, as explained here. Note: Keep in mind that mirroring is not a replacement for backups. If files are accidentally deleted or overwritten by a user or process, mirroring won't help you to bring the old file back. So you are still responsible to do regular backups of your important bits. Storage mirroring can be enabled on a per-directory basis, so that some data in the file system can be mirrored while other data might not be mirrored. On the medatada side, it is also possible to activate or deactivate mirroring per directory, but certain logical restrictions apply. For example, for a directory to be mirrored effectively, the whole path to it must also be mirrored. Mirroring settings of a directory will be applied to new file entries and will be derived by new subdirectories. For instance, if metadata mirroring is enabled for directory /mnt/beegfs/mydir1, then a new subdirectory /mnt/beegfs/mydir1/mydir2 will also automatically have metadata mirroring enabled. File contents mirroring can be disabled afterwards by using beegfs-ctl mode --setpattern without the --buddymirror option. However, files that were already created while mirroring was enabled will remain mirrored.